COLUMBIA, S.C. (AP) — Zombies seem to be everywhere these days. In the popular TV series "The Walking Dead," humans struggle to escape from a pack of zombies hungry for flesh. 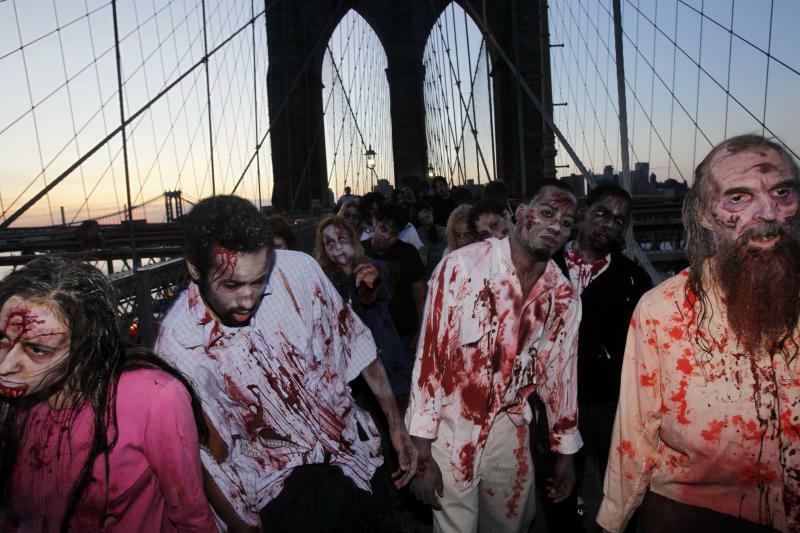 Prank alerts have warned of a zombie apocalypse on radio stations in a handful of states. And across the country, zombie wannabes in tattered clothes occasionally fill local parks, gurgling moans of the undead. Are these just unhealthy obsessions with death and decay? To Clemson University professor Sarah Lauro, the phenomenon isn't harmful or a random fad, but part of a historical trend that mirrors a level of cultural dissatisfaction and economic upheaval. Lauro, who teaches English at Clemson, studied zombies while working on her doctoral degree at the University of California at Davis. Lauro said she keeps track of zombie movies, TV shows and video games, but her research focuses primarily on the concept of the "zombie walk," a mass gathering of people who, dressed in the clothes and makeup of the undead, stagger about and dance. It's a fascination that, for Lauro, a self-described "chicken," seems unnatural. Disinterested in violent movies or games, Lauro said she finds herself now taking part in both in an attempt to further understand what makes zombie-lovers tick. "I hate violence," she said. "I can't stand gore. So it's a labor, but I do it." The zombie mob originated in 2003 in Toronto, Lauro said, and popularity escalated dramatically in the United States in 2005, alongside a rise in dissatisfaction with the war in Iraq. "It was a way that the population was getting to exercise the fact that they felt like they hadn't been listened to by the Bush administration," Lauro said. "Nobody really wanted that war, and yet we were going to war anyway." The mid- to late 2000s also saw an uptick in overall zombie popularity, perhaps prompted in part by the release of post-apocalyptic movies including "Dawn of the Dead" and "28 Days Later." As of last year, Lauro said, zombie walks had been documented in 20 countries. The largest gathering drew more than 4,000 participants at the New Jersey Zombie Walk in Asbury Park, N.J., in October 2010, according to the Guinness World Records. "We are more interested in the zombie at times when as a culture we feel disempowered," Lauro said. "And the facts are there that, when we are experiencing economic crises, the vast population is feeling disempowered. ... Either playing dead themselves ... or watching a show like 'Walking Dead' provides a great variety of outlets for people." But, Lauro pointed out, the display of dissatisfaction isn't always a conscious expression of that feeling of frustration. "If you were to ask the participants, I don't think that all of them are very cognizant of what they're saying when they put on the zombie makeup and participate," she said. "To me, it's such an obvious allegory. We feel like, in one way, we're dead." Kinnard can be reached at http://twitter.com/MegKinnardAP .